Was looking for something a bit different for my 7 year old girl and looks perfect as I wanted something fun with spending a fortune . My daughter has autism and this is perfect for her need to feel safe and secure and also great for play. Not bed tents though . 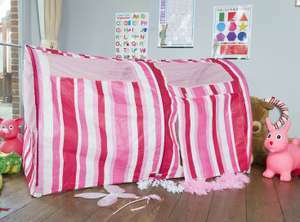 This is perfect for a child's regular bed, most people wouldn't have room for a separate tent in their home I'd imagine. Not bed tents though . This is perfect for a child's regular bed, most …Not bed tents though . This is perfect for a child's regular bed, most people wouldn't have room for a separate tent in their home I'd imagine. My apologies I stand corrected, I had believed this to be attachable to a child's single bed but have realised it is not. I thought it was for sweeping in, but it's for playing.